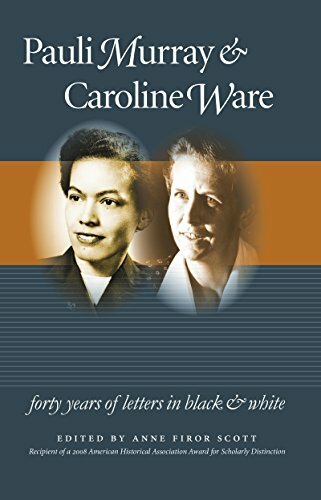 Pauli Murray & Caroline Ware: Forty Years of Letters in Black & White. In 1942 Pauli Murray, a young black woman from North Carolina studying law at Howard University, visited a constitutional law class taught by Caroline Ware, one of the nation's leading historians. A friendship and a correspondence began, lasting until Murray's death in 1985. Ware, a Boston Brahmin born in 1899, was a scholar, a leading consumer advocate, and a political activist. Murray, born in 1910 and raised in North Carolina, with few resources except her intelligence and determination, graduated from college at 16 and made her way to law school, where she organized student sit-ins to protest segregation. She pulled her friend Ware into this early civil rights activism. Their forty-year correspondence ranged widely over issues of race, politics, international affairs, and--for a difficult period in the 1950s--McCarthyism. In time, Murray became a labor lawyer, a university professor, and the first black woman to be ordained an Episcopal priest. Ware continued her work as a social historian and consumer advocate while pursuing an international career as a community development specialist. Their letters, products of high intelligence and a gift for writing, offer revealing portraits of their authors as well as the workings of an unusual female friendship. They also provide a wonderful channel into the social and political thought of the times, particularly regarding civil rights and women's rights. All items subject to prior sale. No questions asked refunds within 60 days. For shipping rates, click "Shipping: Rates & Speed" above. Powells Bookstore Inc., 3429 W. 47th Street, Chicago, IL 60632; catorders@powellschicago.com; 773-376- 8106. VAT: N/A.